I am so happy with all of the pastels I have been seeing everywhere these days. It can only mean one thing, Spring is near! 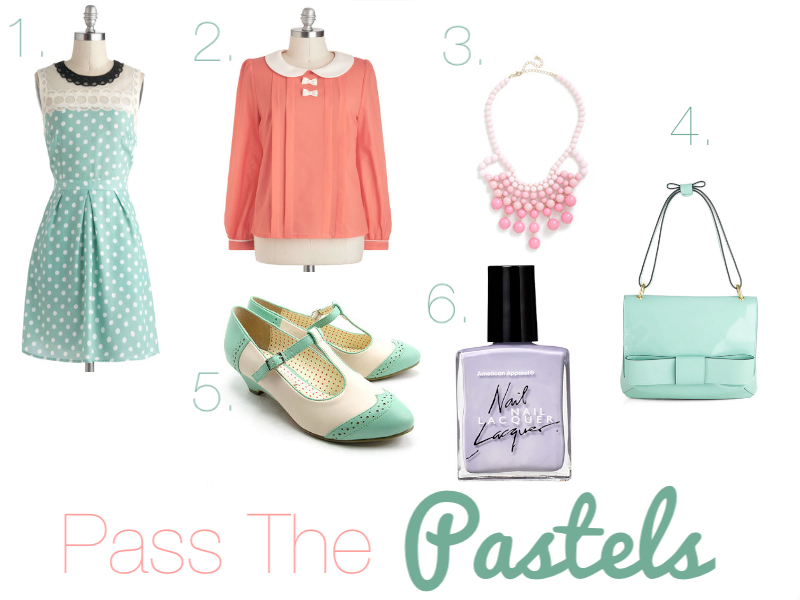 With Spring coming, I feel like I am in need of a bit more of the pastel color palette in my closet. Above are a few of the pastel pieces that have recently caught my eye. I am especially in love with those Bait Spectator T-strap heels! T-straps have always had a special place in my heart, but these are just plain amazing! Bait Footwear has a ton of gorgeous shoes that are perfect for the Spring. So many styles and pretty colors! Pink, mint, and lavender are definitely taking over this Spring. I also wanted to give you all the news that I will be updating Little Red Bowtique (my Storenvy shop) very soon! Expect lots of pretty pastels and collars! I have been wanting to update my shop for the longest time, and I’m so excited to finally get the ball rolling. At the moment, I only have handmade hair accessories listed. I will let you guys as soon as the new listings are up!